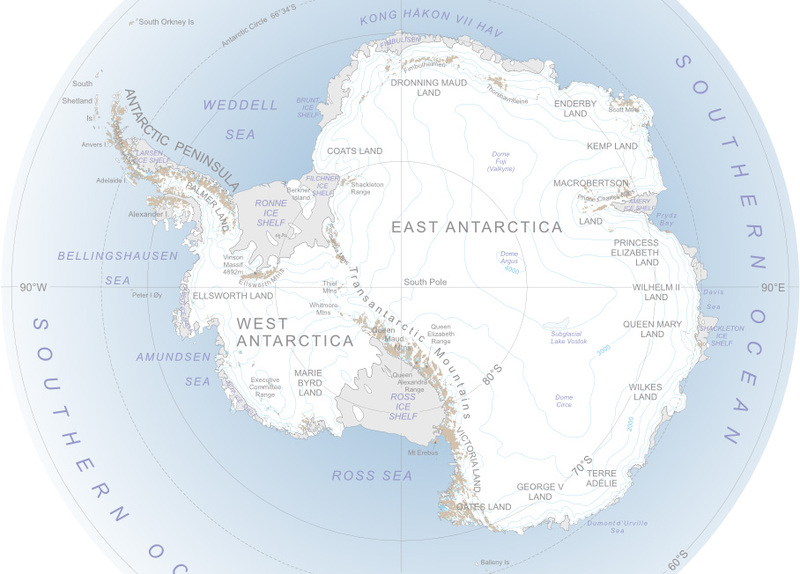 This map shows in broad sweeps how the last continent was revealed to humanity: first the accessible, northern tip of the Antarctic Peninsula; then routes to the coveted South Pole; next the coasts most easily accessible from South America, South Africa, Australia and New Zealand (see how the bulk of West Antarctica remains relatively unexplored, being inconveniently located south of the Pacific Ocean); finally, the forbidding interior of East Antarctica. As a gazeteer of Antarctic exploration and settlement, this map is by no means exhaustive. Many of the more northerly Antarctic Islands, for example, were used as bases by whalers as far back as the early 19th century. For some reason, it seems that commercial ventures do not find their way into the history books as easily as military or imperial expeditions. 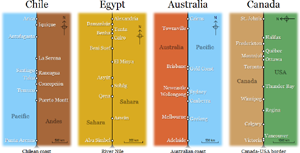 Before 1945, I've concentrated on the expeditions that opened up the continent. After 1945, when various nations began to establish permanent bases on the continent, largely to press competing territorial claims, I've concentrated on these stations. That's not to say, of course, that all expeditions ceased in 1945. On the contrary, the number of expeditions, as well as sorties from the permanent bases, has exploded over the years, so that if this map were complete, there would be thousands of camp icons dotted over the continent. The representation of stations, however, does aspire to be complete. Where a later expedition established a camp on the same site as an earlier one, I've generally not credited the latecomers. I've made exceptions, though, such as for Robert Scott's 1911-12 expedition, which arrived at the South Pole a mere month after Roald Amundsen's party had established a camp there. I've refrained from pressing my own claims. In particular, I've resisted adding a personal camp icon on the Wirth Peninsula, having found myself, rather by accident, in the field party that became the first to set foot on one of those enticing white spaces devoid of icons in Ellsworth Land. Use the slider to the right of the map to show camps and stations for a particular year. Move your mouse over an icon to show details of that camp or station. Thanks for your comment, Igor. You have sharp eyes, to notice that the name Faraday does not appear on the timeline! As you note, the former British station Faraday became the Ukrainian station Vernadsky in 1996, which is why a red dot labelled Vernadsky appears on the Antarctic Peninsula for that year. But that's not the only time the base has changed name in its history. It was originally built by the British as a base called Argentine Islands in 1947, then moved to Galindez Island in 1954, before being renamed Faraday in 1977. Rather than show each of these changes on the timeline, I've showed the base only twice, once as Argentine Islands in 1947, and again as Vernadsky in 1996. I hope you'll forgive the simplification, which does not signify any lack of affection for Vernadsky… though I never quite made it ashore, I have fond memories of peering towards the base through a snowstorm from the old British Antarctic Survey ship the R.R.S. Bransfield.